There are many haunted places in Florida. 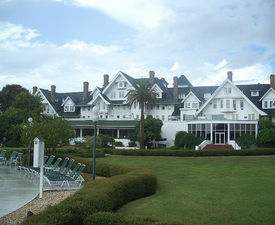 The Belleview Biltmore Hotel Resort that is located in Clearwater, Florida is one of those haunted locations. For several years of the resort's history, numerous guests and employees have reported strange and unusual events such as the physical appearance of apparitions. It is not at all unusual to hear an account of a spirit lingering and wandering throughout the halls of the resort, or of troublesome poltergeists creating a wide array of annoying noises, and even intelligent hauntings that appear to control the elevator system in the structure. If you are interested in haunted places in Florida, you are sure to love learning about the Belleview Biltmore Hotel Resort in the State of Florida. In the year of 1897, an individual that was known to be a Tycoon of the railroad industry constructed a magnificent hotel. This man's name was Henry Plant. This hotel has been the center of attention in the community that it rests in since it first opened its doors. It has often been referred to as the "White Queen of the Gulf". However, throughout the history of the haunted hotel, so many individuals have claimed to experience paranormal events that the resort now offers a ghost tour every weekend. It takes place on Saturday evenings at 8:00pm EST and 10:15pm EST. This ghost hunt is sponsored by the individuals that work at the Orlando Ghost Tours. The Travel Channel has covered many haunted places in Florida. On one show, which is called "Weird Travels" the haunted hotel was covered. The video and photo segments that were highlighted on the show displayed some of the paranormal activity that has taken place in the hotel. This hotel has been officially placed on the "National Register of Historic Places" This resort has been introduced and served many different luminaries throughout history. This includes royalty from Britain, various movie stars, a large assortment of professional athletes, and numerous other notable characters. Several of these individuals claim that this resort is one of the most haunted places in Florida. Different people have had different experiences in this haunted hotel. One couple by the name of Yvonne Houston and her husband, Joseph Houston, took a very interesting picture while at the Belleview Biltmore Resort and Spa. The picture was taken with one of those small, disposable cameras that can be picked up at any store in Florida. On December 4th, at approximately 11:30pm EST, the couple stood at the bottom of the historic staircase in the hotel. Someone took the picture of them and managed to capture what they believe to be one of the structure's ghosts. In the picture, there is a mist that actually resembles a person standing and looking at the couple. While there is a lot of speculation regarding this picture, the couple and several others insist that it is definitely a spirit. A ghost hunter that was interested in determining whether or not the Belleview Biltmore was truly one of the most haunted places in Florida decided to do an investigation of the structure. While at the haunted hotel, he noticed something a bit unusual - the misty appearance of a woman dressed in fashion that was common to the 1930s. The lady appeared quite visibly to him. He attempted to get close to her without success. This took place on the third floor. The man continued to the fourth floor. Suddenly, he began to experience physiological symptoms such as sweating and became light headed. Suddenly, the voice of a female stated: "Don't go up there, they are mad at me". The same man, engulfed in curiosity, proceeded to the area of the fifth floor of the hotel. It was at that point that he overheard what appeared to be two men in a heavy debate over something. While it was quite loud, his wife could not hear it. He managed to catch several EVPs during his investigation and on one of them, he heard a man that was not present in his ghost hunt identify himself as "Walter". He also captured numerous pictures that contained unusual images for which no explanation could be offered. Many who have visited the hotel claim that there are ghostly children lingering throughout the structure. This comes from hearing running, laughter, and playing of children - even when there are none around. Is the Belleview Biltmore hotel one of the most haunted places in Florida? According to witnesses, the answer is "Yes".... Check for the lowest price, get directions, view photos, and read the reviews and traveler tips for the Belleview Biltmore Hotel.